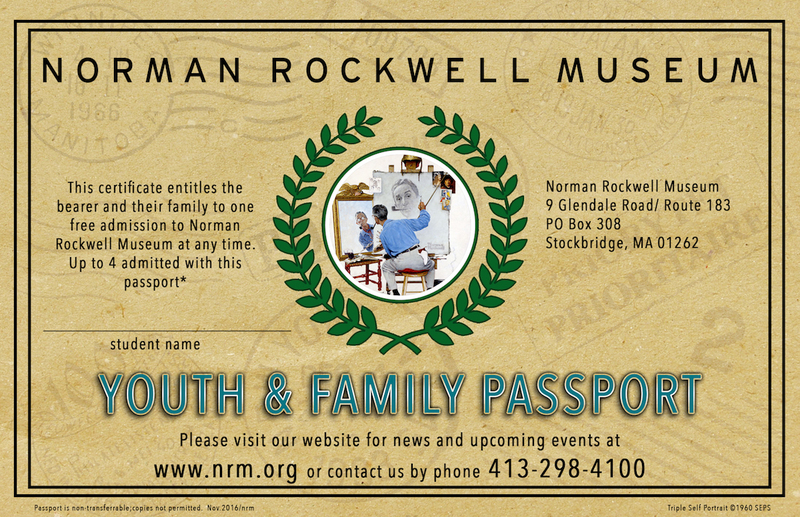 The Norman Rockwell Museum offers numerous programs that cater to patrons of all ages. We have categorized them below. Click on ADULT, TEEN, or Kids & Family to further refine the listing of programs. We create guided tours and activities, art experiences, and archive visits that directly support the standards you identify. Using the iconic Rockwell imagery; Norman Rockwell Museum is ready to create a meaningful learning experience for your students. Fully-guided visits are $5 per student, with free admission for teachers and chaperones. Funding is available for Title I schools based on availability. Email Us to Plan Your Trip! Berkshire County Student Passport Program provides a full 360-learning opportunity for local 3rd and 4th grade students. This program includes an in-classroom introduction to the art of Norman Rockwell, including an interactive drawing experience with a Museum educator, and a curriculum-inspired interactive visit to the Norman Rockwell Museum. A third program component features a special Family Day experience that invites children and their parents and caregivers to enjoy the Museum together. Participating students will also receive a special Student Passport for a free return visit with their families. All gallery and classroom experiences are available free to program participants. The Museum offers interdisciplinary educator workshops designed to integrate the visual arts in a variety of curriculum areas. Let us help create an experience that is tailored to your specific needs. Letters documenting Professional Development Points (PDPs) are available. Images reflect the times and cultures of the artists who produce them. During this in-depth look at a diverse range of imagery, educators will discuss how art reflects or comments upon the values of society, how it is influenced by social, political and economic beliefs, and why it has evolved over time. This workshop offers a participatory, discipline-based approach to looking at and understanding works of art. Participants will explore the artistic process of decision-making through observation, discrimination, comparison and contrast, art making, and the use of expressive language to convey ideas. This lively investigation of the narrative aspect of works of art and illustration’s close link with the language arts will explore a variety of visual and literary story-building techniques. Our interactive programs are designed to provide students with meaningful, national curriculum-based experiences that use original works of art to encourage discovery relating to the visual arts, history/social studies, and language arts, emphasizing distinct learning connections. Don’t see what you are looking for? We are happy to customize our programs to meet the needs of your group. Sessions can also be customized to suit the needs and focus of any group, and may be scheduled in our museum galleries or at a school location. 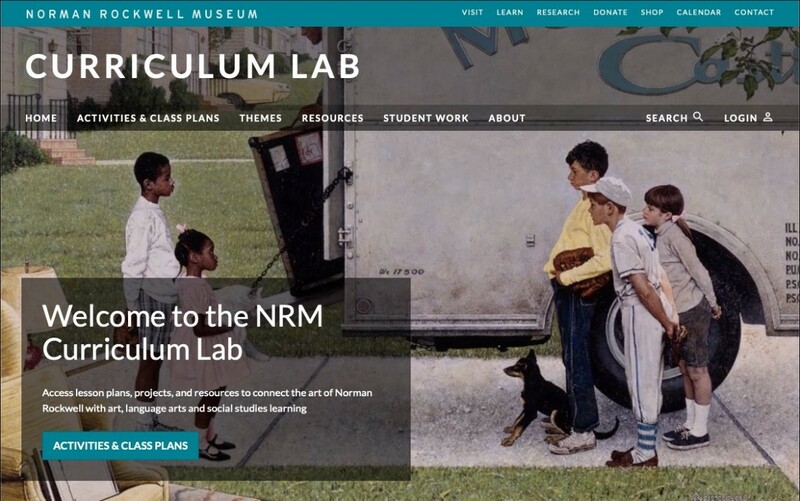 Access lesson plans and activities connecting the art of Norman Rockwell with art, language arts, and social studies by visiting the Museum’s Curriculum Lab. All materials can be downloaded and printed for classroom use. Download the entertaining and educational Family Guide. 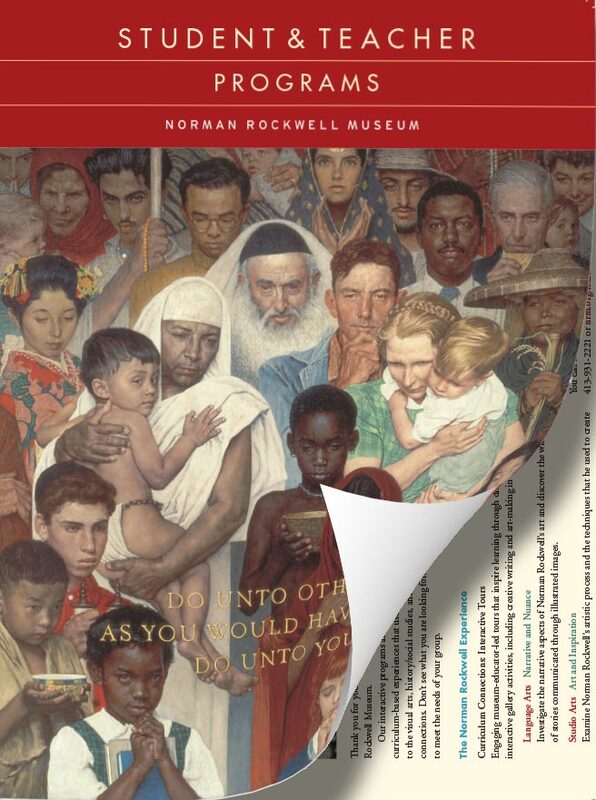 Norman Rockwell Museum has created a Resource Packet for Educators to accompany the exhibition Norman Rockwell: Pictures for the American People. Here you will find lesson plans and resources to connect Rockwell with your curriculum. These interdisciplinary lessons and activities are flexible and can easily be altered based on the interests, questions, and responses of your students. We hope you will use these materials and share your lesson refinements and student responses with Norman Rockwell Museum. An evaluation form is included. 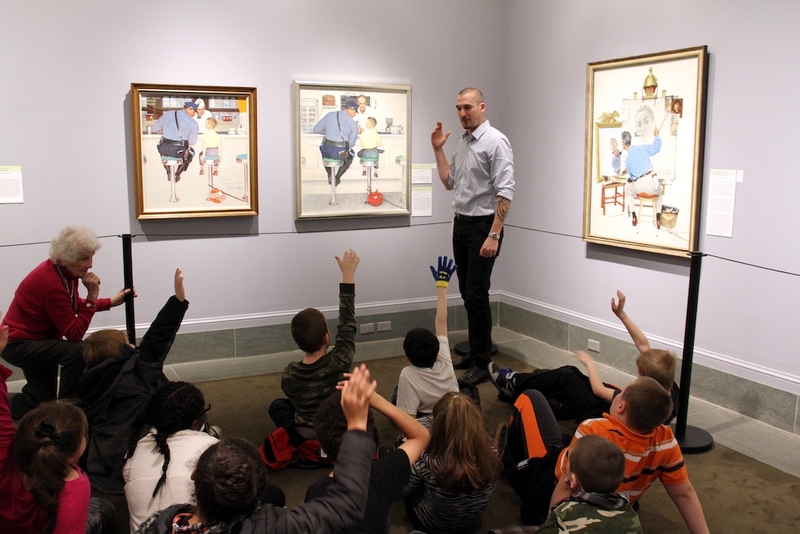 Educational programs for Norman Rockwell: Pictures for the American People are made possible by Fidelity Investments through the Fidelity Foundation. – The following prints to support the lessons: Saying Grace, Triple Self Portrait, The Runaway, The Golden Rule, The Four Freedoms (Freedom of Speech, Freedom to Worship, Freedom from Want, Freedom from Fear), Outward Bound, Going and Coming, The Gossips, The Shiner, Girl at the Mirror, The Marriage License, New Kids in the Neighborhood, The Problem We All Live With, The Family Tree, Shuffleton’s Barbershop. Teachers will receive 20% off items purchased for educational purposes from Norman Rockwell Museum Store. For phone orders, call 1-800-742-9450. Please have your school purchase order number ready. Mail orders must be on official school letterhead. Our interdisciplinary teacher training workshops offer the opportunity to explore practical ways to use visual arts in a variety of curriculum areas. Consult with us to create an experience tailored to your particular needs. Professional Development Points (PDP’s) are available. Explore Norman Rockwell’s use of literary elements and develop ways to enhance your students’ writing. Rockwell employs the formal elements of design to communicate crisp messages with a variety of purposes. Discover the means to create stories without words. For nearly seven decades Rockwell captured moments of social importance both momentous and ordinary. How are we connected to those events? What has changed since then? What is similar now? Explore these and other questions. Among humankind’s highest achievements, art both reflects and influences our experiences in an ever-changing world. Images are multi-layered, conveying personal meanings and important societal perspectives if we understand their history, how they are made, and their purpose and place within culture. At the Norman Rockwell Museum, art is the inspiration for Go Team!, an innovative experiential workshop that uses image-based gallery activities to increase effective team collaboration in the workplace. Led by a dynamic team of Museum educators, participants will be immersed in the art of Norman Rockwell and engaged in a series of guided activities designed to stimulate creative thinking, cooperation, group connectivity, and enjoyment of the team-based decision-making process. After a lively and informative look at the Museum’s seminal collection of original artworks by legendary American illustrator, Norman Rockwell, small, mid-sized, and larger teams will be invited to connect with each other as they explore our visual sensory environment through Gallery Games, Archeological “Digs,” Hands-On Art Making, Creative Writing, and more. Along the way, conversation about each team’s process, effectiveness, and the challenges that they faced will heighten awareness of the positive aspects of group interaction and the joys inherent in thinking outside the box.